2019 Nissan Altima vs 2019 Toyota Camry | Which is the Best Family Car? 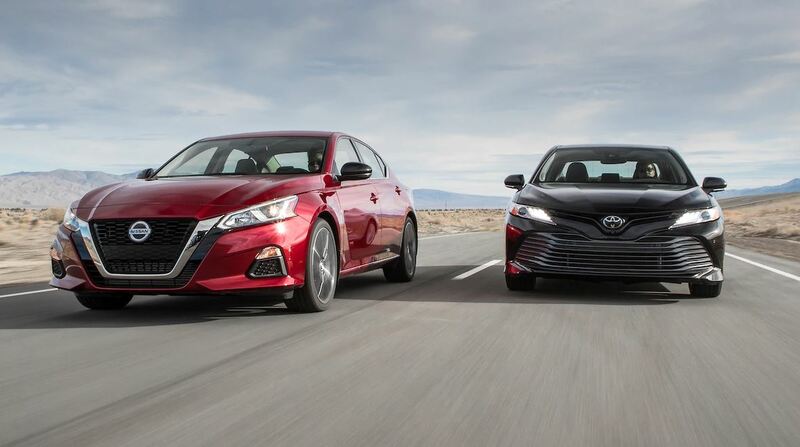 The 2019 Nissan Altima & the 2019 Toyota Camry go head to head in MotorTrend’s March Mayhem event. In this round, they compare the two vehicles that are the newest in their market, the best selling, and the most well known to determine which is the best family car. While these two vehicles may appear pretty similar from a distance, on the inside the differences are striking. While containing most of the same technology and infotainment–except for the standard AndroidAuto connectivity that separates the Altima from Camry–the materials used in the Camry are lackluster compared to the Altima’s finely accented zero gravity front seats. The Altima also offers more front leg room, standard remote engine start, and standard Intelligent Forward Collision Warning. In the rear, the seats of the Camry open narrowly, making it difficult to fit in a car seat. The Altima rear doors open up to almost 90 degrees, making it extremely easy to install a car seat. The Altima also has the standard Rear Door Alert system, which gives audible and visual heads up in the instrument panel, reminding the driver to check the back seat. The 2019 Nissan Altima is also more affordable than the Camry, with a base price starting at just over $30k for the Altima, while the Camry starts at close to $35k. With more space, power, and technology, the Altima keeps you feeling sporty, while keep your family safe. Like what you see in the 2019 Nissan Altima? Browse our inventory or give us a call today! Author fz@uto_bloggerPosted on March 20, 2019 Categories 2019 Nissan Altima, Buying a New Car, Nissan Models, The Newton Advantage, Versus the CompetitionTags 2019 Nissan Altima, Best Family Car, Nissan Altima, Toyota CamryLeave a comment on 2019 Nissan Altima vs 2019 Toyota Camry | Which is the Best Family Car? Recieve — remember that it’s “i before e except after c.” Correct spelling: Receive. Definately — also sometimes “defiantly,” which is just too harsh. correct spelling: definitely. Wendesday — anyone else say “wed – nes – day” in their head? Just me? Correct spelling: Wednesday. Sandwhich — the extra “h” is not actually necessary. Correct spelling: sandwich. Seperate — easily corrected by another in-your-head pronunciation: “sep-AH-rate.” Correct spelling: separate. They’re, there, & their — easily the easiest words to misuse. “They’re” = “they are;” “There” is for places; “their” is a possessive pronoun. Principal or principle? — remember that your principal at school is your “pal”; your principles are your values or standards. Tommorow — this one is especially fun to misspell while writing in cursive. Correct spelling: tomorrow. Goverment — you actually have to “govern” to have a government. So don’t forget the “n” in there! What words do you find yourself misspelling (or Googling to get right)? Why Buy a Newton Certified Pre-Owned Vehicle? We know there are a lot of options when considering a vehicle purchase. New, used, certified pre-owned–it can get a little confusing. For most people, the most important piece of the car-buying puzzle is price, right? You want to know you are getting the best deal. At Newton Nissan South, we want you to get the best deal as well the best experience possible. However, there’s more than just price & experience involved in your deal. The vehicle itself must be in the best condition possible, especially used or pre-owned vehicles. Keep reading for more information on how we re-condition our Newton Certified Pre-Owned vehicles. What work goes into a Newton Certified Pre-Owned Vehicle? During this inspection, we decide what needs to be repaired. For example, if the tire treads are extremely worn down, we will go ahead and put new tires on the vehicle. 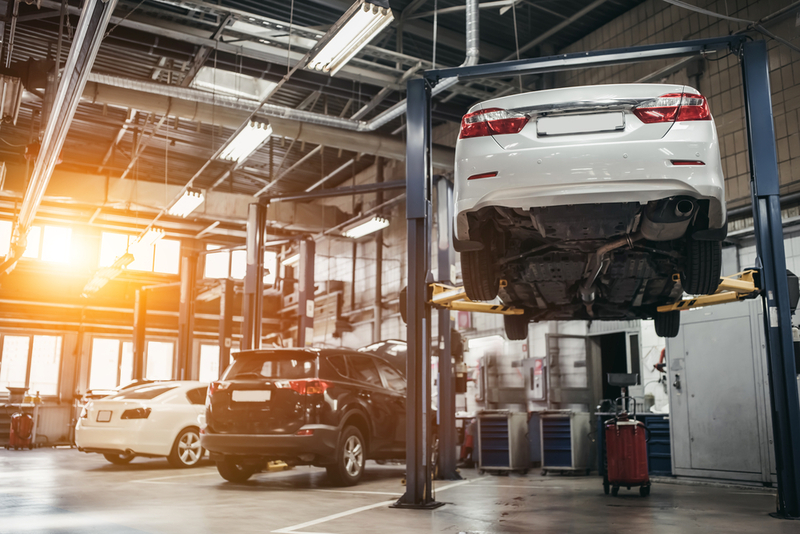 During your visit with us, we will go over these details with you to make sure you know what work was needed and how we took care of the vehicle — so that you don’t immediately have service bills on top of your purchase! Please note that we do our best, but we do not claim perfection or that a vehicle will never have problems. Again, we will be very transparent up front about any issues we saw. Don’t hesitate to ask us questions! What’s included with a Newton Pre-Owned Certified Vehicle? At Newton Nissan South, we take pride in our used inventory. We don’t just give them a car wash, a once-over, and park them out front. We make sure they are thoroughly ready to go before you make your decision and drive off our lot! Let us help you find your next Newton Certified Pre-Owned vehicle today! **Please note: our cheaper, pre-auction line cars undergo an inspection to a lesser degree to keep them affordable for customers looking for a more inexpensive option. View our PAL inventory here. Author fz@uto_bloggerPosted on February 19, 2019 Categories Buying A Pre-Owned VehicleTags Newton Pre-Owned, Used Cars, Used Cars Murfreesboro TN, Used Cars Shelbyville TN, Used NissanLeave a comment on Why Buy a Newton Certified Pre-Owned Vehicle? What are Pre-Auction Line (PAL) Cars? Pre-Auction Line vehicles, or “PAL” for short, are available to the public for a limited time before being released to independent dealerships. A free Carfax® report is still available for these vehicles. PAL vehicles fall outside of Newton Motor Group’s traditional inventory offerings and are sold as-is without a warranty. Are PAL cars still inspected? Yes, PAL cars still receive an inspection; however, repairs or service work are generally not performed. This is to keep the vehicle as affordable as possible. How do I know if the vehicle I’m interested in is a PAL car? Pal Cars are priced more affordably and typically have high mileage. Additionally, during your time at the dealership, we will go over important notes about the vehicle’s condition and have you sign documents that state you understand that the vehicle is sold “as is,” meaning you take full responsibility for any service work that the vehicle may need because it has not been reconditioned like our other used vehicles have been. What happens if something goes wrong with my PAL car after I leave? Once you sign the agreement and purchase the vehicle, you release Newton Nissan South from all liability for any issues with the vehicle. However, we are happy to help in any way we can. Our certified technicians will take care of you, and you will receive a discounted labor rate for the work needed for your vehicle. Have more questions? One of our sales team would love to help you. You can chat with them below, call, or email. Please let us know how we can best serve you! We are here to give you the simplest & best car-buying experience in Middle Tennessee! Author fz@uto_bloggerPosted on February 19, 2019 Categories Affordable, Buying A Pre-Owned Vehicle, Frequently Asked QuestionsTags Cash Cars, Inexpensive Cars, Pre-Auction Line, Pre-Owned Vehicles, Used Cars Murfreesboro TN, Used Cars Shelbyville TNLeave a comment on What are Pre-Auction Line (PAL) Cars? Did you know that you do not need to make an appointment for an oil change at Newton Nissan South? We know life gets busy and that your time is very valuable, so we want to help by offering an Express Service lane so that you can get in and out of the service drive as quickly as possible. Beginning February 18, thanks to our Express Service Lane you will no longer need to make an appointment. You can come at your convenience, on your time. What services can you receive in our Express Service Lane? Simply pull into the right lane at our service center in Shelbyville, TN. Our Express Service adviser, Anthony, will welcome you, assess your vehicle’s needs, and our Nissan certified technicians will get to work on your vehicle! While you wait, enjoy free coffee, snacks, water, and Wi-Fi! We also have a children’s play area where your kids can have some fun with chalk and games. Don’t forget the complimentary multi-point inspection! Additionally, you’ll also receive a FREE multi-point inspection of your vehicle. This is an important step for your service visit, as it can alert you to a problem in your vehicle before it shows up as a much more expensive issue down the road. At the end of your visit, your service adviser will go over the inspection with you and answer any questions you may have. You will be alerted to any issues, such as how your tire treads are looking. Have other service needs? Schedule an appointment for those here. Need to see your vehicle’s maintenance plan? Look that information up here. You can also browse our service coupons here! Starting in 2019, Newton Nissan South launched the Newton Advantage, a new benefit of purchasing your new Nissan with us here in Shelbyville, just a short drive north of Nashville. We offer this because we want to offer the best to our customers, who are more like family to us. Included in the Newton Advantage is a 2-year Carefree Maintenance Package and a Lifetime Warranty. What vehicles qualify for the Newton Advantage? The Newton Advantage applies to all new vehicle purchases. We also have a Newton Certified Pre-Owned warranty on select used vehicles. How long is the “lifetime” warranty really good for? The Lifetime Warranty is valid for as long as you own the vehicle. You simply must return to our service center every 5 years for a free inspection. The Carefree Maintenance plan is for 24 months (or 30,000 miles), which gives you 4 oil changes, tire rotations, lube, and filter changes. The Newton Advantage is absolutely free. We want to be your Nissan dealership for life, not just as a customer, but as our family & friends. The Carefree Maintenance Plan requires that you get your oil changes & tire rotations here at our service center in Shelbyville, which is only a short drive from Murfreesboro, Franklin, and Manchester. You can trust our Nissan-certified technicians and enjoy free coffee, snacks, and WiFi while you wait. However, there is no requirement to get your car’s service for the Lifetime Warranty done here. Just follow the manufacturer’s recommended maintenance plan and keep all your records. Can the Lifetime Warranty be transferred? No. The Lifetime Warranty expires when your vehicle is sold, traded, or deemed a total loss. The following components, parts, and labor are covered: Engine, Transmission, Transfer Case, Drive Axle, and Seals & Gaskets. Some restrictions do apply, so ask your service adviser for more details on exactly what is and what is not covered. Have other questions? Please call us for more information. We look forward to speaking to you more about the Newton Advantage soon! Have you heard our latest radio commercial? 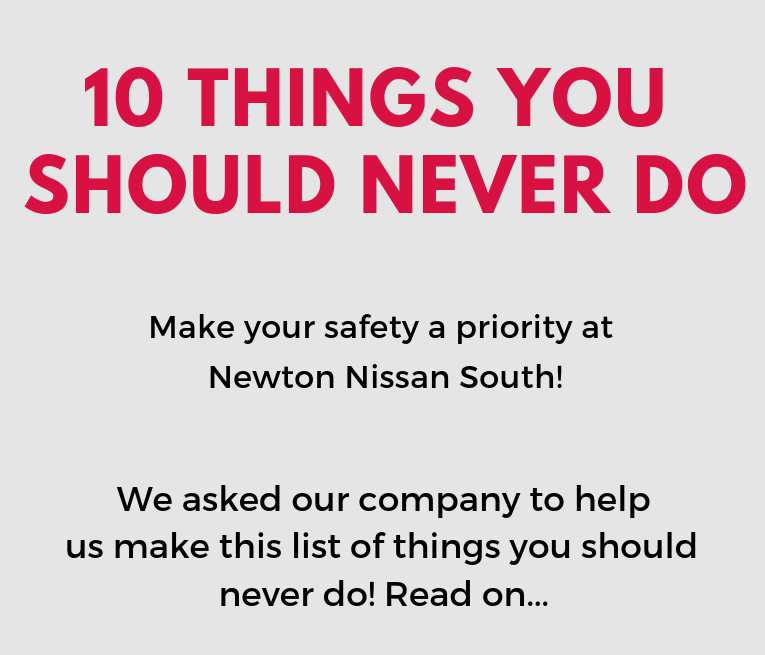 In it, Mike Abbondanza mentioned a few things that you should never do, including: buying a car from any other place than Newton Nissan South! Why? Because of the Newton Advantage. 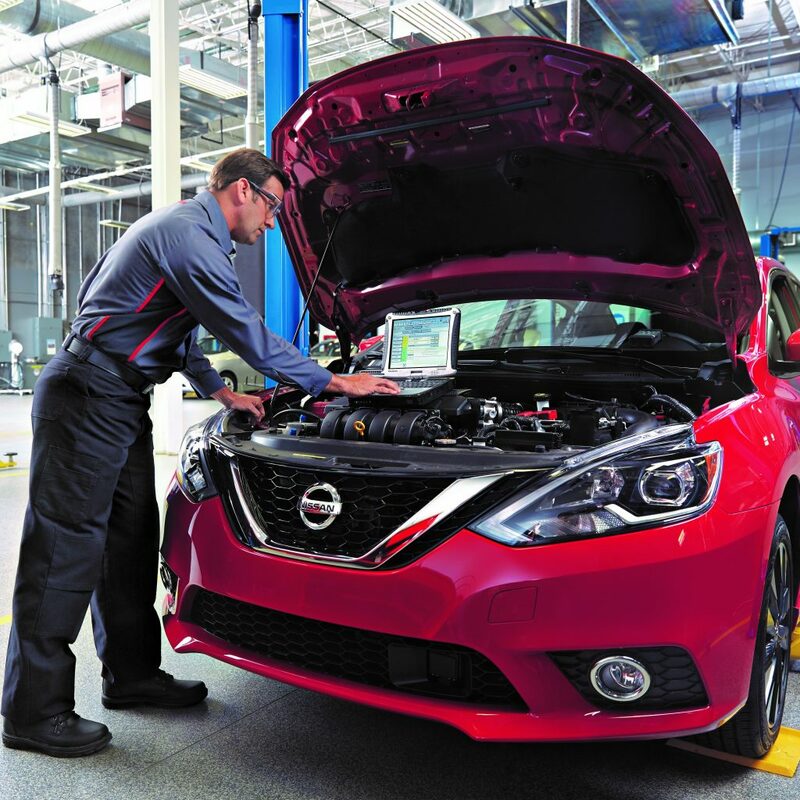 We’ve got you and your new Nissan vehicle covered with both a 2-year Carefree Maintenance Package and — brand new for 2019 — a Lifetime Powertrain Warranty! Combine that with our customer service and our goal to make your car-buying experience as simple & stress-free as possible, and that’s it: the Newton Advantage. We decided to add more to that list with 10 things you should never do! We asked our co-workers and had some fun making this list. for a chance to win a $10 Subway Gift Card! Download the Newton Nissan South App! Have you downloaded our Newton Nissan South App yet? In order to help our customers have an easy & simple process to buy and service their vehicle, we’ve invested in the Newton Nissan South App! No matter where you are — in the market for a new vehicle, looking to schedule your next service visit, wanting to refer a friend to Newton Nissan South, our app is the tool you’re looking for! Why should you download another app? redeem loyalty rewards for a free oil change! Download the Newton Nissan South App Today! *The Newton Nissan South App is provided by Mobile Dealer. Author fz@uto_bloggerPosted on January 15, 2019 Categories 2019, Murfreesboro News + Events, Newton Nissan South App, Our Customers, Shelbyville News + EventsLeave a comment on Download the Newton Nissan South App! The New Year is almost here, and that means new Nissan models continue to roll out. The 2019 Nissan Altima, with its major design updates, was a big hit, and now two more newly designed models have been introduced: the 2019 Nissan Maxima and the 2019 Nissan Murano. This is the 3rd generation re-design of this popular crossover, which focuses on giving upper-class style an affordable price tag. This year’s exterior refresh includes an upgrade on the front v-motion grille, redesigned headlights and taillights, and new wheel designs. On the inside, the trim is updated with leather features on both the seats, armrests, and center console in the Platinum trim. This smart technology actually learns the driver’s steering patterns and helps alert the driver when drowsy driving is detected. This feature alerts the driver to check the rear seats when exiting the vehicle. By model year 2022, Nissan aims to have RDA on all four-door trucks, sedans, and SUVs. This technology is standard for the 2019 Nissan Murano’s Platinum trim and as a part of the additional SL Technology Package. The 2019 Nissan Murano is coming soon! Until then, check out our 2018 Nissan Murano lineup, which still features many great safety and convenience technology! We hope to see you soon at Newton Nissan South in Shelbyville, TN! ‘Tis the season for Christmas music! 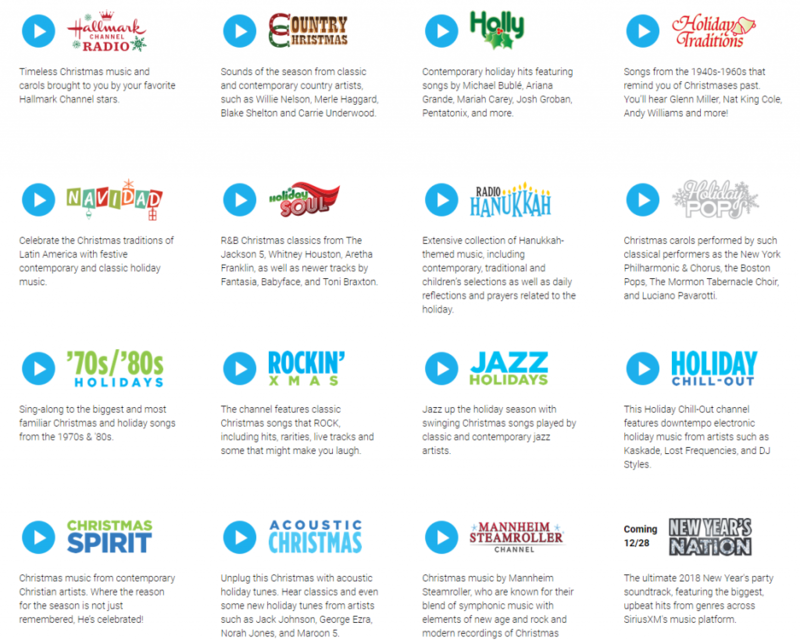 Now that it’s December, we are currently listening to Christmas music on repeat with SiriusXM Radio here at our store. Are you listening to Christmas music yet? Personally, I’ve been listening since Trunk or Treat ended! We’ve been enjoying the all-new Hallmark Channel here! Let us know what you’re listening to, if you’re in a vehicle equipped with SiriusXM. We’re wishing you a happy, safe holiday season — filled with great memories, food, and music!